Finally! 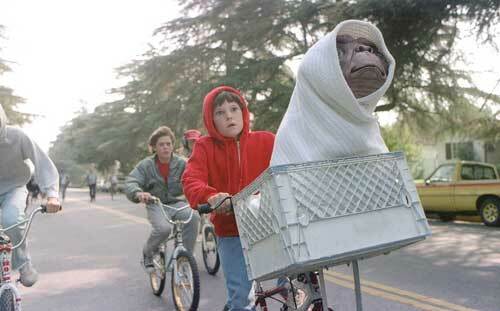 One of the most loved science-fiction movies, E.T. The Extra-Terrestrial gets its Blu-ray debut as part of Universal Studios’ 100th anniversary releases. It’s also the film’s 30th birthday. Directed by Steven Spielberg, whose Jaws also debuted on high-definition for Universal’s 100th celebration, E.T. won four Academy Awards when it was released in theaters back in 1982, for Best Sound Effects, Best Visual Effects, Best Sound and Best Original Score for Spielberg’s long-time collaborator John Williams (The Adventures of Tintin). The film also was nominated for cinematography, film editing, Melissa Mathison’s screenplay, Spielberg’s direction and the biggest Oscar, Best Picture. The Blu-ray disc, a Blu-ray/DVD combo pack, includes the original 1982 version of the movie, starring a young Drew Barrymore (Big Miracle) and Henry Thomas (Dear John) as a brother and sister who help a stranded alien. E.T. was digital remastered for the Blu-ray release and upgraded to new 7.1 surround sound. “The E.T. Journals” with newly released behind-the-scenes footage by cinematographer John Toll. “Steven Spielberg & E.T.” new interview with the famed director as he reflects on the film and talks about working with the actors.